The Haoman 17 nightclub in south Tel Aviv, typically a hangout for young, techno-loving, alcohol-fueled gay club-goers, hosted an unusual event last Saturday. 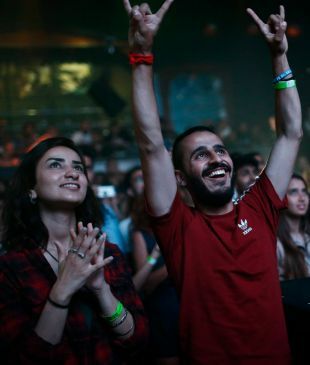 As the lights dimmed, thousands of young men and women crowded onto the dance floor, in eager anticipation of some of the best Palestinian fringe acts performing here as part of the first “Roots of Art” festival. 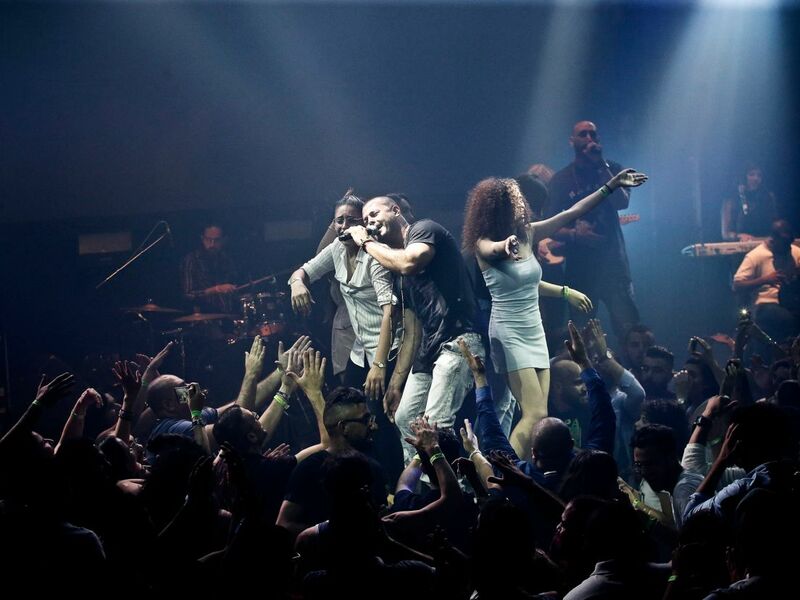 The festival organizers – Ramle businessmen Jalil Dabit and Alfred Sousou – said it was the first time prominent figures from the scene have all appeared together simultaneously in the same place. Time will tell whether it's the first in a new series or just a one-off. A kind of "attendance-taking" was conducted via a giant screen: Each time the name of an Israeli city appeared on screen, members of the audience would cheer for their hometown. Tel Aviv was not represented, but Jaffa, Nazareth, Haifa and Eilabun (a small Arab town near Safed) all were. 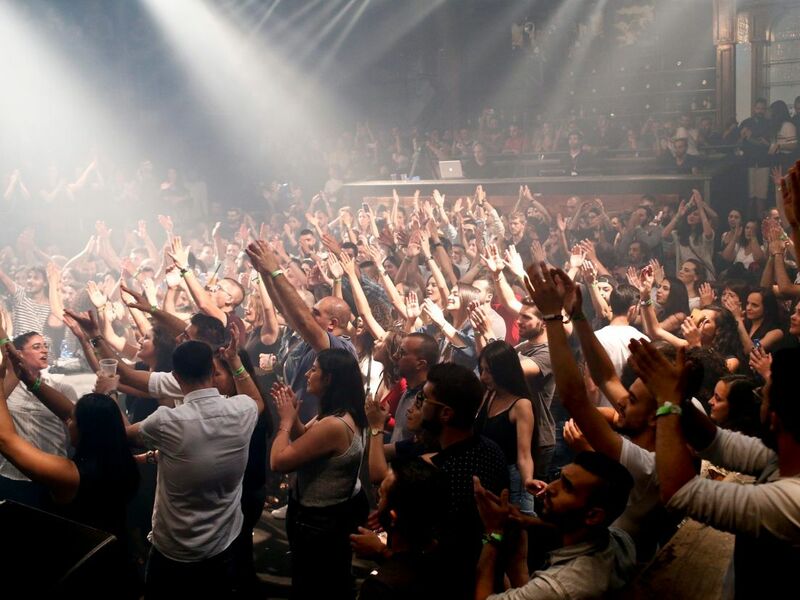 As it turns out, Haifa and Nazareth are currently the two most important cities in the local Arab music scene, the former as the center for electronic music and nightlife, and the latter for its indie pop music. 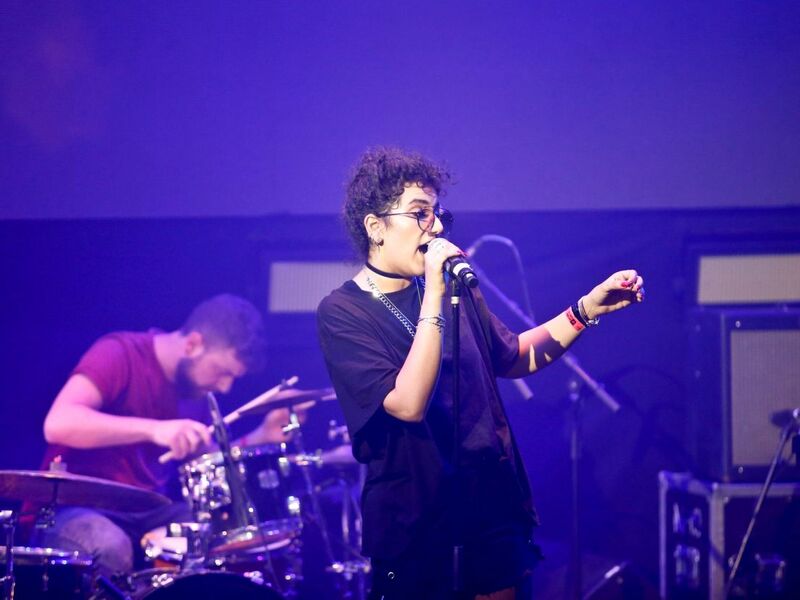 The evening was opened by Zenobia, an instrumental electronic dabke duo from Haifa. Over the past year, Zenobia has played parties in Jerusalem, Haifa and even Ramallah. The duo’s two members, Nasser Halahlih and Isam Elias, perform in keffiyehs, headbands and dark sunglasses, a look modeled, none too subtly, on Omar Souleyman. But with all due respect to the king of Syrian wedding music, who is credited with reviving the genre, the Haifa duo is dabke’s future. They play multiple keyboards and create a dabke with a dash of Levantine acid. The experience is terrific and faithful to the original. Yet Zenobia particularly shone when it slowed the rhythm and speed of the traditional dance and switched to a house-oriented beat. For about an hour, they played their lengthy, synthesized mantras over a chunky beat that put the club’s amplifiers to the test. To date, they have released only one song officially, and from the excitement on their faces and the way they built their set, it was clear that they’re still a little green. Nevertheless, if they polish their performance a bit, there’s no reason why they shouldn’t succeed abroad. People overseas are crying out for authentic music like this, and they could make it without taking the Tel Aviv nightclub route. Between performances, the Haifa DJ SuperMike performed for the crowd. He began with Arab music with a reggaeton feel and then switched to a set that included modern hits and big names like DJ Zeki’s “Europe the Lebanese”; East Jerusalem rapper Muhammad Mughrabi, who performs under the name Jabid; and “Intro to Shamstep” by the Palestinian-Jordanian group 47Soul. The latter group is also familiar to Israeli Jews, and quite a few Israeli producers would probably be happy to host it here. When its piece was played, there wasn’t a person in the club who didn’t recognize it. Later in the evening, the charismatic rapper Saz performed with his troupe, as did the Nazareth-base groove/pop/reggae band Ghazali. The latter was noteworthy both for its captivating bass and the infectious joie de vivre of its soloist. Immediately afterward, the group Apo and the Apostles performed. It was founded by Apo Sahagian, an Armenian resident of Jerusalem. The festival then closed with rapper Tamer Nafar of Lod and his veteran group Dam. Jalil Dabit, the event’s co-producer, told Haaretz prior to the festival that it “isn’t political.” Nevertheless, his decision to hold it in Tel Aviv could be seen as making a strong political statement of trying to break through the walls of the occupation and take a stand against the fear that many Jews feel of the Arabic language, which silences, or at least weakens, the spectacular Palestinian music that has sprung up here in recent years. The festival is proof that there is demand for musical events like this even outside Arab or mixed cities. Audience members, who paid the non-negligible price of 130 to 160 shekels ($36-$44) per ticket, voted with its feet. In 1968, the first “rhythm festival” took place at the Tel Aviv Cinerama Club. According to people who were present, politician and activist Uri Avnery, who was at the time an MK, opened the evening with a speech in praise of rhythm as an international movement that bridged the ocean and brought together young people from around the world, addressing himself to young Israelis whose sights were set on music from overseas. Fifty years later, young Israelis are already well connected to the world. But most are still not connected to the music and musicians that have sprung up an hour’s drive from Tel Aviv.